I had emailed Christopher Andrew (author of the authorized history of MI5 - Defend the Realm/Defence of the Realm) a few weeks back asking if he had any further information on Robin W.G. Stephens, commandant of MI5's secret interrogation centre, Camp 020. Specifically, I was interested in any information on Stephens' death. I haven't actually looked at the original KV folders that were used as the source for the Camp 020 book by Oliver Hoare. Perhaps there is more in there than I had thought? 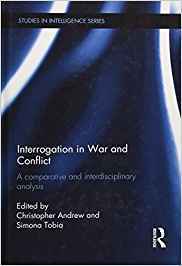 Andrew & Tobia - this is a 2014 publication: Interrogation in War and Conflict: A Comparative and Interdisciplinary Analysis - It definitely looks interesting and it's been on my radar for a while. Unfortunately it comes it with a rather exorbitant price tag on Amazon - $157 (even the Kindle edition is $80). There don't appear to be any Canadian libraries that carry it... so it may have to go onto my "next-time-I'm-in-London" list at the British Library. TLS - this is the Times Literary Supplement - apparently in 2013 Calder Walton wrote a rebuttal to Ian Cobain's book, Cruel Britannia. Calder Walton worked as the lead researcher when Christopher Andrew was writing his authorized history of MI5. There would appear to be a back and forth that took place between Walton and Cobain but, without being a subscriber to TLS, my access is limited. So there are a few leads here... most of which need a visit to London. On the other hand, I may email Calder Walton, as he was the lead researcher on Defend the Realm/Defence of the Realm and might have some helpful insights.